Monica Magness, founder of the Pink Artist Project, is a self taught textile and doll artist living in Madison, Alabama. Her endless enthusiasm and creativity are the inspiring force that has drawn hundreds of artists to work together in support of breast cancer research. 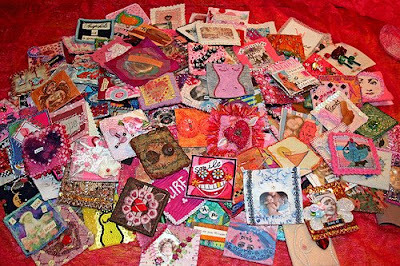 In 2008, the Pink Artist Project raised more than $3,000.00 for the Susan G. Komen Foundation and breast cancer research. 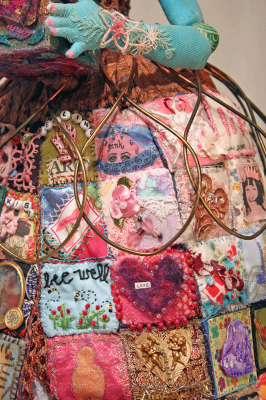 The Pink Artist refers to a community of artists world wide who joined together to create ONE art doll to raise money for Susan G. Komen for the Cure. The Pink Artist Doll Love Squared. One square from each of the 180 artists is featured on the art doll Love Squared with 182 artists in total helping to create her. She stands just under 40" tall and weighs 6 lbs 2 ounces. To enter the fundraising draw for the doll and runner up prizes, donations were made and the donors names were entered into the draw. 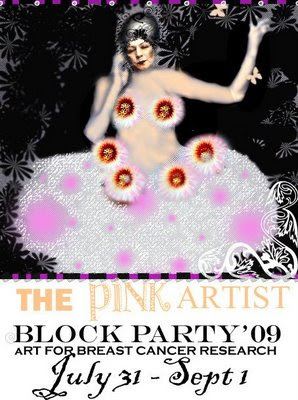 Block Party 2009 is a group of 24 artists reuniting with block art creations left over from The Pink Artist doll project. They have come forth to stitch up the remaining squares into 10" x 10" blocks that will be sewn together to make ONE unified art quilt. 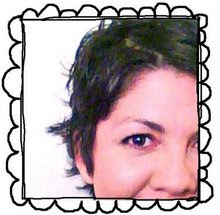 We are pleased to support this worthwhile project and encourage you to visit Monica's blog Girl Gone Thread Wild for more information on how you can participate and become part of Block Party '09. What a great post! Colorful artist...but all artist are colorful aren't they? This was a treat to learn about Monica Magness and her contribution to a cause. I'll have to check out her blog! I really like the colours used in her projects and the sense of rythm that each of her compositions establish when she uses small squares to create the dresses.